Walter “Clyde” Frazier was born on the 29th March 1945, in Atlanta, Georgia, USA. He is a former professional basketball player as a point guard in the NBA from 1967 to 1980, representing the New York Knicks (1967-1977) and Cleveland Cavaliers (1977-1980). He is a two-time NBA champion, seven-time All-Star selection, and a Hall of Fame inductee. Frazier earned most of his money thanks to basketball, during a professional career which began in 1967, and ended in 1980. Have you ever wondered how rich Walter Frazier is, as of mid-2016? According to the authoritative sources, it has been estimated that Frazier’s net worth is as high as $4.5 million, most of his money having been generated by playing basketball at the professional level, and more than 35 years after retirement, he’s still a millionaire. Walt Frazier was the eldest of nine children, and went to Atlanta’s David Tobias Howard High School where he played as a quarterback for the football team, and also a catcher on the baseball squad. His school was all-black in the racially segregated South in the 50’s, and he was forced to play basketball on a dirt playground. He matriculated in 1963, and then attended the Southern Illinois University on a basketball scholarship – Frazier was excellent at football too, and was even offered a scholarship for that sport. In college, Frazier was one of the best young players in the country and led his team to the NCAA Division II Tournament, but lost to Jerry Sloan’s Evansville Purple Aces after overtime. In his senior year in 1967, Walt and SIU won the National Invitation Tournament at Madison Square Garden after defeating Marquette University 71-56; Frazier was named MVP of the tournament. Frazer was picked-up by the New York Knicks as the 5th pick overall in the 1967 NBA Draft. He got his nickname “Clyde” while in New York because of the resemblance of his hat to Warren Beatty’s from the “Bonnie and Clyde” (1967) movie. During his ten years with the Knicks, Frazier won two titles in 1970 and 1973, was selected seven times to the All-Star game, and was an MVP of the All-Star game in 1975. He was even the first player to have a shoe named after him – “Clyde” by Puma. Frazier and Earl “the Pearl” Monroe formed the famous “Rolls Royce Backcourt” in the ’70’s, one of the best back-court combinations in the history of the game. Walt Frazier held several Knicks records for years before Patrick Ewing broke most of them in the 90’s. Frazier had most – games (759) and minutes (28,995) played, field goals attempted (11,669), field goals made (5,736), free throws attempted (4,017), free throws made (3,145), assists (4,761), and points (14,617); his assists record still stands today. Frazier spent ten years in New York, and then played the last three seasons with the Cleveland Cavaliers where he retired in 1980. He was inducted into the Naismith Memorial Basketball Hall of Fame in 1987 and was also named one of the 50 greatest players in 1996. After finishing his professional career, Frazier started to work as a player agent, but that didn’t last long. He lived in the U.S. Virgin Islands for quite some time, and even opened a bed and breakfast establishment. Walt then became a broadcaster with the Atlanta Hawks in 1981 and later switched to the Knicks in the same post in 1987, and still works in a similar capacity. Regarding his personal life, Walter Frazier’s marital status and the number of children is unknown as he kept it privately, except that he was married to Martha Clark(1965-67). 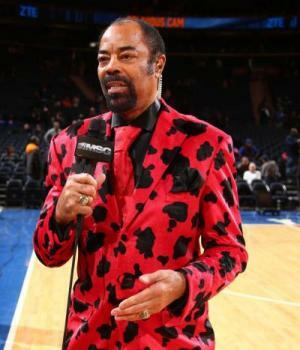 Frazier established The Walt Frazier Youth Foundation to provide support for high school students from inner-cities, and opened a fine dining restaurant named Clyde Frazier’s Wine & Dine near Madison Square Garden in Manhattan. 1 Was the oldest of nine children. 2 Guard for New York Knicks (1967-1977) and Cleveland Cavaliers (1977-1980). 3 New York Knicks all-time assists leader (4,791). 4 Played for Southern Illinois University (1963-1967). The Sporting News All-America second team (1967). Division II All-America (1964, 1965). Named to All-Tournament Team. Named Division I All-America (1967). Named MVP of 1967 NIT. 5 NBA All-Rookie Team (1968). All NBA First Team (1970, 1972, 1974, 1975). All-NBA Second Team (1971, 1973). NBA All-Defensive First Team (1969, 1970, 1971-1975). Seven-time NBA All-Star (1970-1976). NBA All-Star Game MVP (1975). New York Knicks all-time assist leader (4,791). Retired his number (10) with the Knicks in 1979. NBA 50th Anniversary All-Time Team (1996). 6 Known for his flamboyant wardrobe in the seventies. 7 Enshrined in the Naismith Memorial Basketball Hall of Fame in 1987. 8 Played for the National Basketball Association's (NBA) New York Knicks (1967-1968 thru 1976-1977) and Cleveland Cavaliers (1977-1978 thru 1979-1980).